Lots of people asked about my trip to Atlanta for the Atlanta Pen Show last spring. Many people were surprised that such a thing actually existed and it occurred to me that most people have no idea that you can actually buy a wide variety of writing products beyond what you can find in Target or Staples. Lamy Aion Olivesilver with an extra fine nib and Pilot Iroshizuku Ku-jaku ink. The pen was my big purchase at the Atlanta Pen Show this year. I’m a huge Lamy fan and this pen is exactly what I want in a modern, premium pen. The extra fine nib is nice, although I may switch it out for a Lamy 1.1 mm calligraphy nib. The bright blue Iroshizuku ink is a great match for the silver pen body. Retro 51 Tornado. I like having a Retro 51 in my rotation. I switch between the Kiwi Classic Lacquer and the special edition Pen Addict Ice-o-metric. Pilot Hi-Tec-C Coleto 4 Color with black, red, brown and green refills. The Coleto is a multi pen with four slots, like the multi pens you used when you were a kid, but you can customize the colors in the pen to your liking. Being able to change colors is especially useful when taking notes. Blackwing Volume 54. Blackwing’s latest special edition, Volume 54, is an exercise in surrealism. I love the look of the pencil and the extra firm graphite core. I hate that I only purchased one box of these. The pencils don’t fit in the Sinclair case so they live in a NockCo Chimneytop with my other pencils and sharpener. I use these mostly for sketching out ideas in my sketchbook. Kuru Toga 0.5 mm. I have a bunch of Kuru Toga Mechanical Pencils. The nice thing about a Kuru Toga is the lead rotates every time you pick the pencil up, so you never get an unbalanced point. The pencil in rotation the most is a lime green translucent version with 0.5 mm lead. Story Supply Edition 407, Dot Grid. This was another Atlanta Pen Show purchase. I’ve started using a small notebook for task management and meeting notes. I have some South Carolina County Fair Field Notes and I like them, but the paper in the Story Supply Notebooks is thicker and works better with my fountain pens. Leuchtturm 1917 Master Slim. I wrote about it a few months ago, but my go-to sketchbook for projects right now is this massive, A4+ sized, 122-page hardcover notebook. Dot grid. 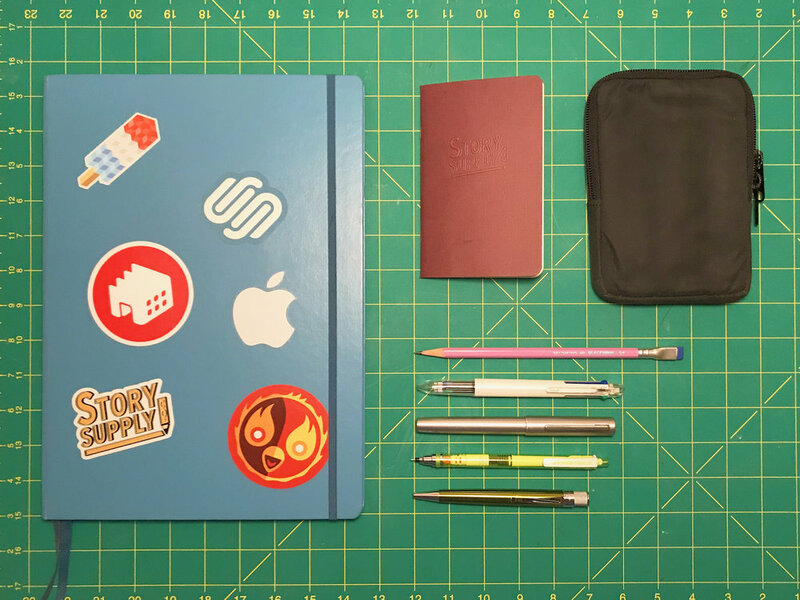 Every single idea for my 52 Shirts project started in a Master Slim notebook. Similar in style to a Moleskine, but higher quality. I’ve decided to sticker my current sketchbook… It’s a good look. If you are interested in looking for pens or pencils, there are lots of online retailers with good selections. Unfortunately, there are very few brick-and-mortar stores where you can find a nicer selection of pens. I recommend starting at JetPens. They’ve got a little bit of everything and solid product reviews. And most of the purchases won’t break the bank so you can experiment with different types of pens and pencils and figure out what you like. If you decide to make the jump into fountain pens, Pen Chalet or Goulet Pens are great options.